The Battalion is accepting applications for the last open spots in the corps’ color guard and trumpet sections. For a limited time, those using a special promo code will receive 25% off all items in the Blue Devils Pro Shop. Blue Knights’ drum major Ashley Drayer shares her observations from the corps’ successful trip to Bahrain and a long layover in Germany. Blue Stars is seeking one or two individuals to join their 2017 food service program. Interested parties should have experience in large-scale food preparation, maintaining a budget, and nutritional guidelines. Bluecoats announced that the corps’ new indoor color guard program will compete in the WGI Independent World division in 2018. The Cadets will be holding a rehearsal camp April 28-30 in Hopewell Valley, New Jersey. There are still openings for males in the color guard. Columbians’ April 21-23 rehearsal camp has been moved to Ochoa Middle School in Pasco, Washington. Genesis is holding a rehearsal and color guard audition camp in Bastrop, Texas April 28-30. Golden Empire is holding its second color guard audition and workshop on April 30 at Bakersfield College in California. May 6 is “Burritos for Bugles” night at the San Marcos, Texas Chipotle. By informing the restaurant staff you’re supporting Guardians, 50 percent of the proceeds will be donated to the corps. 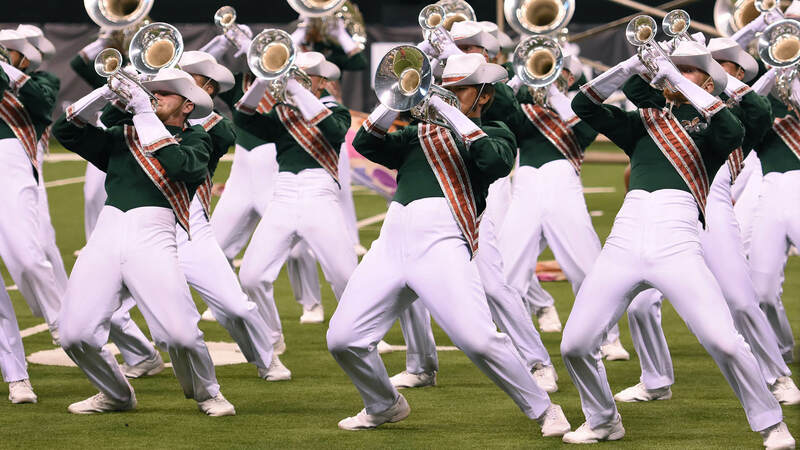 Incognito invites all prospective members to attend the corps’ next rehearsal camp on May 7. There are open positions in the brass, color guard, and front ensemble percussion sections. Jersey Surf’s April rehearsal camp and color guard spring audition weekend will be held April 21 to 23 at Camden County Technical School in Sicklerville, New Jersey. Louisiana Stars will be holding auditions for the corps’ final brass and color guard positions this weekend on April 23. The 18th Annual “Rockin’ For A Cure” ALS benefit, hosted by alumni and friends of the Madison Scouts will take place this Saturday, April 22, at the Radisson Hotel Madison in Wisconsin. The event pays tribute to Madison Scouts alums, Steve Weekes, Mike McKenna and Chuck Eikel, whose lives were cut short by ALS. Mandarins will be holding final color guard auditions April 28-30. Final auditions for Music City’s color guard will be held April 28-30. Oregon Crusaders named the members of its 2017 health and wellness team. Fans wishing to support Pioneer during its 2017 summer season may contribute to the corps’ “Down the Road” campaign, which provides numerous options to help defray the daily costs of touring. This week Vanguard Music and Performing Arts announced that DCI Hall of Fame member Michael Gaines will join the organization as its creative director. “With the addition of Michael, I feel like our design ‘dream team’ is truly complete,” Vanguard program coordinator Scott Koter said. Seattle Cascades has a limited number of brass and color guard positions available for its 2017 summer season. The corps has an audition camp this weekend, April 21-23. Starting Monday, April 24, Spartans will be hosting “United Way Community Connection,” a daily radio show on WSMN 1950 that will feature interviews with nonprofits from the Greater Nashua, New Hampshire area. After last year’s induction of corps founder Freddy Martin and his wife Lynda into the Spirit of Atlanta Hall of Fame, the organization named four more individuals who will be inducted this year. Troopers need drivers this summer for the corps’ support vehicles.